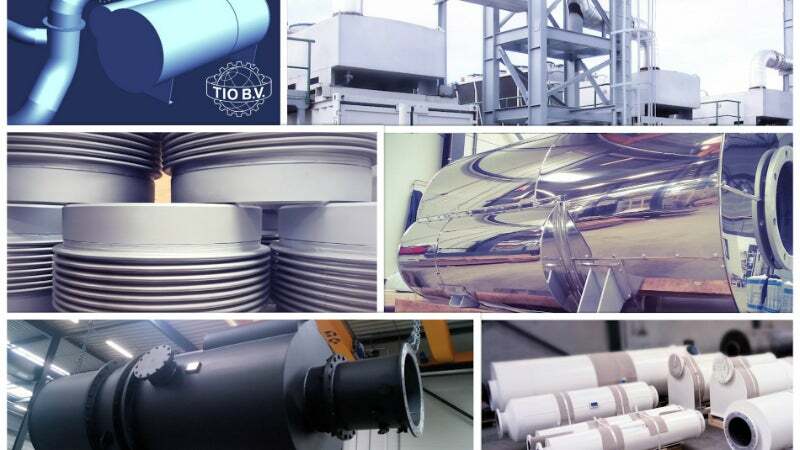 TIO BV (Technische Industriële Onderneming), established in 1934, is a wordwide leading manufacturer of industrial silencers and exhaust accessories for small, medium and large diesel and natural gas engines as well as inlet and outlet silencers for any situation where gasses are flowing. Our comprehensive and versatile range of products are supplied to customers active in numerous fields including, marine, offshore, power generation, gensets and total-energy, process industry, petrochemical industry, railroad, machines and vehicles. About half of all sales are to customers outside the Netherlands, placing the company as a worldwide supplier. Customized silencers are our specialty. We can produce a virtually infinite range of custom-built silencers in a wide variety of materials, sizes and shapes, including round, oval and rectangular cross-sections. If preferred, we can design your own range of silencers, as we did for some of the leading equipment and engine manufacturers. Our modern 65,000ft² facility in Krimpen aan den IJssel, the Netherlands, is well-equipped for the production of silencers. All components are in-house engineered and manufactured. One of our main strengths is therefore a very short delivery time. Our logistics and expediting departments manage all of your shipping requirements, whether it is a simple accessory or a silencer. More than 65 people are fully dedicated to the design, engineering and production of our products. These people, together with our well-equipped facility gives us the capability to handle orders of any size, any shape or complexity. Combining these product options with superior quality, innovation, competitive prices, great service and short delivery times makes TIO your perfect partner for your project. We are committed to engineering excellence and to design the right silencer to meet your specific noise requirements, regardless of shape, size or complexity, from a cylindrical to a box-type silencer, from a single component to a turn-key application. Our engineers are ready for you – we carry out noise measurements, noise reports and acoustic calculations, as well as velocity and back-pressure calculations of your complete installation. In addition to this, we can also advise in vibration control, mounting, material selections and strength calculations. TIO BV has developed the broadest range of inlet and exhaust silencers designed to meet the requirements for any application. We provide absorption, reflection and reactive silencers, spark arresters (in any shape and if required) and combinations of these in one silencer housing. Tio BV's vertical exhaust silencers are used in cogeneration facilities, generator sets and gas-fired heating systems. TIO BV provides acoustic engineering, acoustic solutions, industrial silencers and all related products for any application where noisy gasses are flowing. Rectangular silencers for container applications, or box silencers, are a breed apart, and are commonly used for power generating purposes. TIO BV designs and develops engine manifolds and customised exhaust items for a wide range of clients, manufacturers and distributors. TIO BV has constructed the MTHDS blow-off silencer models, which have been used globally for decades. TIO BV exhaust silencers are being installed on many high-power gas engine brands available. TIO BV has been supplying vacuum truck silencers for a wide range of international operating clients for many decades. Exhaust after-treatment systems and/or catalytic exhaust products are installed in any exhaust system. TIO BV has been a cogeneration exhaust expert for several decades. The company supplies directly to global cogeneration engine manufacturers and indirectly to a wide range of engine distributors, installers and end users. TIO BV has engineered and manufactured silencers for bulk-handling systems in all sizes for several decades. TIO BV is a world-leading gas engine exhaust specialist, offering expert advice and Made in Holland solutions. Following our cogeneration newsflash from last month, we are now very proud to announce that, at the very beginning of this years summerholidays, we have orders for the exhaust silencers for nearly all leading brands high power gas engines. Regular clients already know it: TIO nearly never closes! If we say custom design silencers, we mean CUSTOM design silencers. While yet some months in operation, we are now very proud to officially present TIO Yacht Exhaust Systems BV to the world. This 8000mm long horizontal DN1000 resonance / absorption silencer is a great example of the international character of our company. In late afternoon sunlight: this fully in SS304/1.4301 executed, vertical secundary DN500 radial in and radial out silencer will be installed on the exhausts of a decentralised cogeneration plant, together with a carbon steel primary resonance silencer. Recently transported: a beautiful steam blow-off silencer for one of the world' s leading oil and gas companies. More and more digital data is being used worldwide creating a fastly growing market for datacenters and related for datacenter emergency power. Our paint and expediting departments have put the finishing touches on a total of thirteen pressurised blow-off silencers for another project in the US. The final items out of a total of six large exhaust silencers are getting ready now. The stainless-steel DN900 resonance / absorption exhaustgas silencers will silence the exhausts of six 10MW gasengines serving a gas powerplant in the USA. This 'as Dutch as you ever get' industry leader, known as one of the largest dredging companies in the world, also uses TIO BV exhaust silencers. We just finished two complete DN400 exhaust systems. Ordered in mid-January and recently ready are three TIO box silencers type VRDAD DN250. Recently transported: Four sets air intake- and exhaust systems for a greenhouse cogeneration plant in Russia. Recently, three large TIO resonance / absorption silencers were painted for the French cogeneration market. Starting at the beginning of August, TIO will export four large silencers to a power plant on the African mainland. TIO has supplied two compact DN300 VDAD silencers with built-in sparkarrester to a Norwegian client. At the end of March, TIO supplied a first pilot of five catalysts to its French final customer. TIO's brand new stainless steel pickling area is now in operation. Two 12MW resonance absorption chimney silencers for a power plant on the African mainland are ready for painting. The silencers have a diameter of 2m, a total length of 12.5m and are suitable for free-standing. TIO is delighted to announce the completion of another international contract. Visit our website to see pictures of the finishing welds being executed on a ND1200 (48") silencer with built-in spark arrester. This silencer will be soon transported to the Argentine client, where it will be installed on a 10MW diesel engine of a well known Finnish brand. This October, TIO will supply the first silencers for a series of passenger catamarans to it's Turkish client in the Istanbul region. In mid August, TIO supplied the first two of a large series of chimney silencers for emergency power installations. In the middle of July, TIO supplied four large NW600 exhaust silencers to one of our French clients. TIO BV Silenceers is having a very busy June, with some large silencers waiting for their paint and packing treatment before being shipped to customers. TIO has delivered two special rectangular exhaust silencers for a 3MW (emergency) power system for a Dutch-based data centre. As an order for our French agent Cat-Ex, TIO supplies three prototype silencers for three lines of mobile lifting systems. Earlier this year, Schiedam based Huisman Equipment received a lot of complaints from their neighbours in a residential area about noise pollution. On 18 August, our company was hit by a large fire. A significant part of our main production facility was destroyed. Fortunately our main office was saved. During the biggest sports event in 2012 this summer in London, the transportation of people across the water is being executed by tenders from Alumax located in Meppel, Netherlands. End 2010 some TIO employees finished the course Sustainable Entrepreneurship. After this course we started with the implementation of the Environmental Barometer. Following 1.5 years of testing two different prototypes, TIO is set to supply the first series of 12 new PED compressor silencers in May 2012. In week 14, we finished the TIO exhaustsilencers for a project of a world leading Dutch dredging company. For many years, TIO has supplied silencers for the vacuum industry. These relationships are not strictly limited to the well-established blower and compressor manufacturers. TIO BV supplies several ranges of custom-built SS spark arresters for one of the world's leading crane manufacturers. The spark arresters are used in the company's power applications.